Take the opportunity to spend 3 hours with a ranger on a drive through one of the monument’s most beautiful areas. During the time we visited, the tour went out every day at 9am and space was limited to 10 people. Since reservations were needed, I called the Kris Eggle Visitor Center and got Miss M and myself on the list. On the appointed day, at the appointed time, Miss M and I met our driver, Ranger Anna (the young woman who cleared up the mystery of 4th graders for me; read about that here: http://www.rubbertrampartist.com/2016/02/16/i-have-a-4th-grader/), and Ranger Mark, the actual guide who did the talking. After a brief stop at the campground to pick up the other folks who were going on the tour, we were on our way. 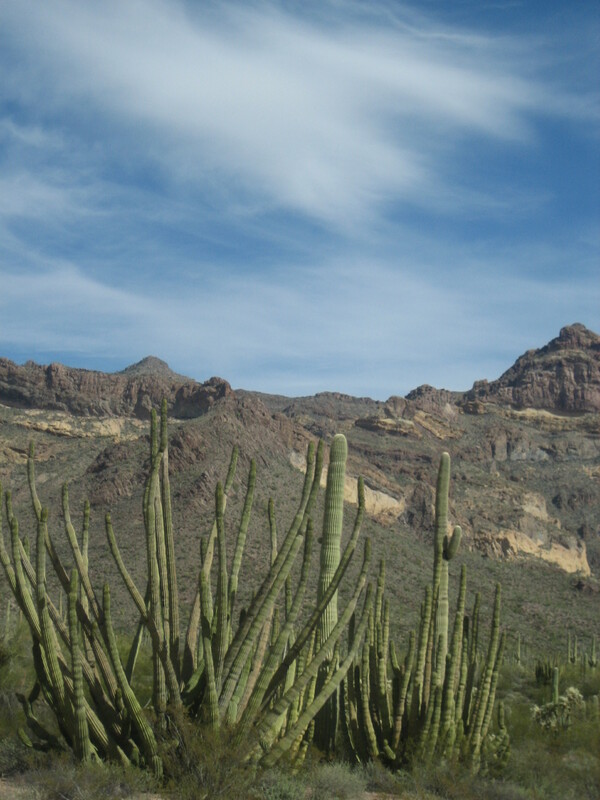 This is organ pipe cactus as seen on the Ajo Mountain van tour. the most popular scenic drive in the monument. It is a 21 mile, mostly gravel road usually passable by normal passenger car. RVs over 24 feet are prohibited, due to the twisting and dipping nature of the road. The American Southwest website (http://www.americansouthwest.net/arizona/organ_pipe/ajo-mountain-drive.html) gives a great description of this drive and of the road itself, and I will quote extensively from that page. 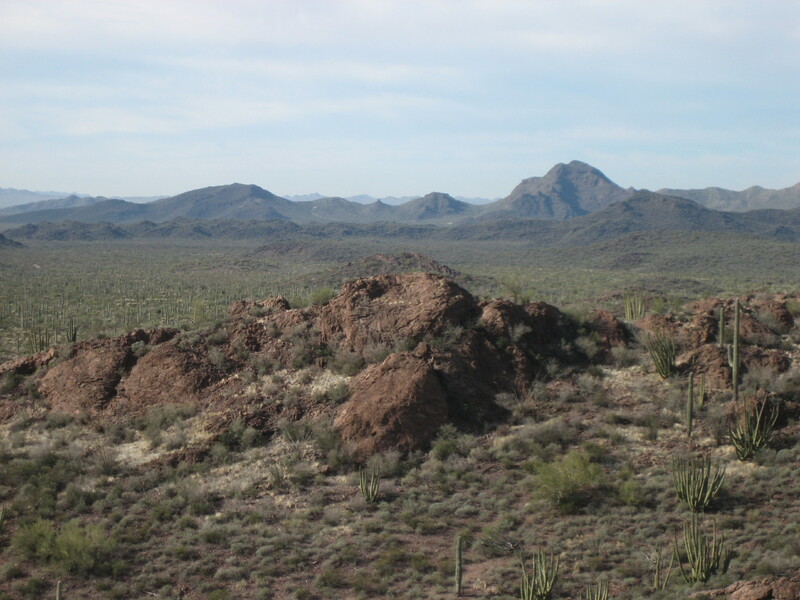 …the main backcountry scenic route in Organ Pipe Cactus National Monument is..the Ajo Mountain Drive, a mostly unpaved loop that heads towards the foothills of the Ajo Range, the high, rocky ridge which forms the eastern boundary of the preserve. Although only 21 miles in length the drive still takes around 90 minutes (without stops) since the road is often narrow and very bumpy – so is not recommended for RVs…, but the scenery is magnificent, comprising extensive cactus plains separated by imposing volcanic mountains also covered with many and varied desert plants, all with no sign of civilisation. 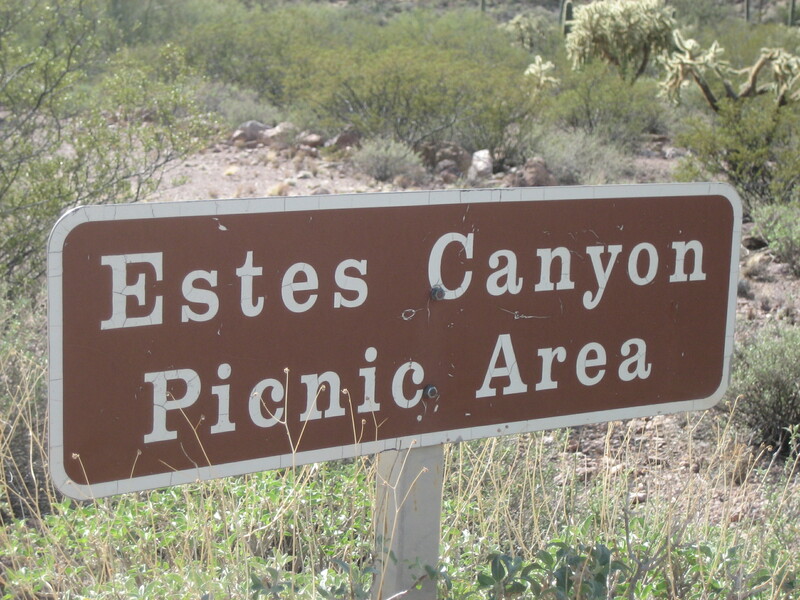 Two trails start along the way; the Bull Pasture/Estes Canyon loop, perhaps the best hike in the national monument, and a one mile path up a short side canyon to a natural arch. 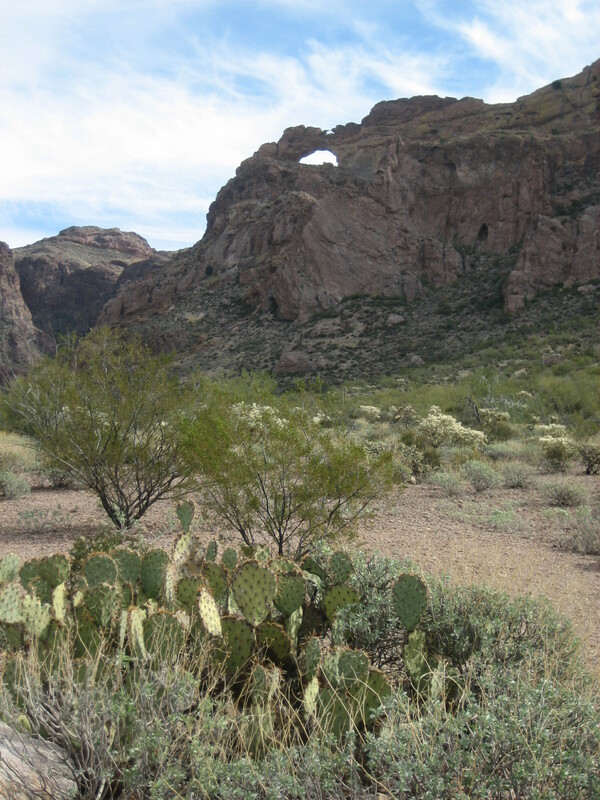 This photo shows a prickly pear cactus, and Arch Canyon in the distance. 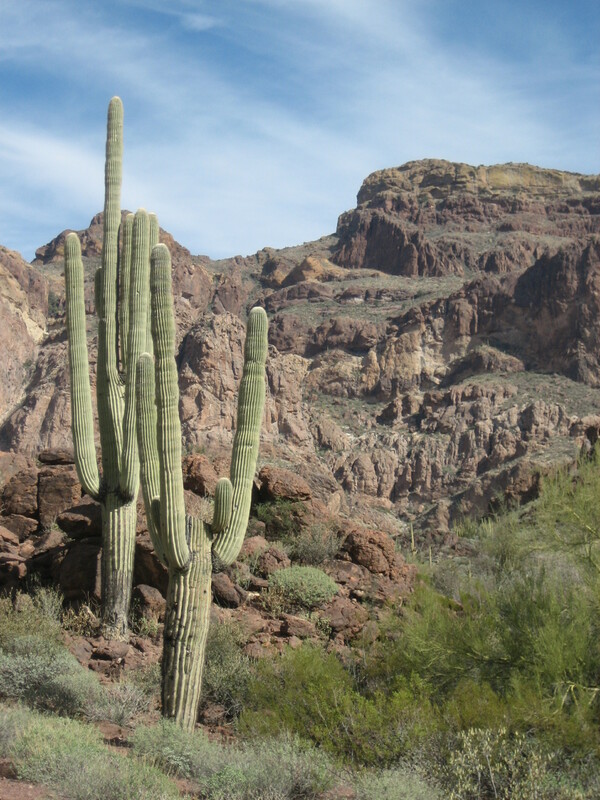 This photo shows saguaro cacti growing near Estes Canyon picnic area. 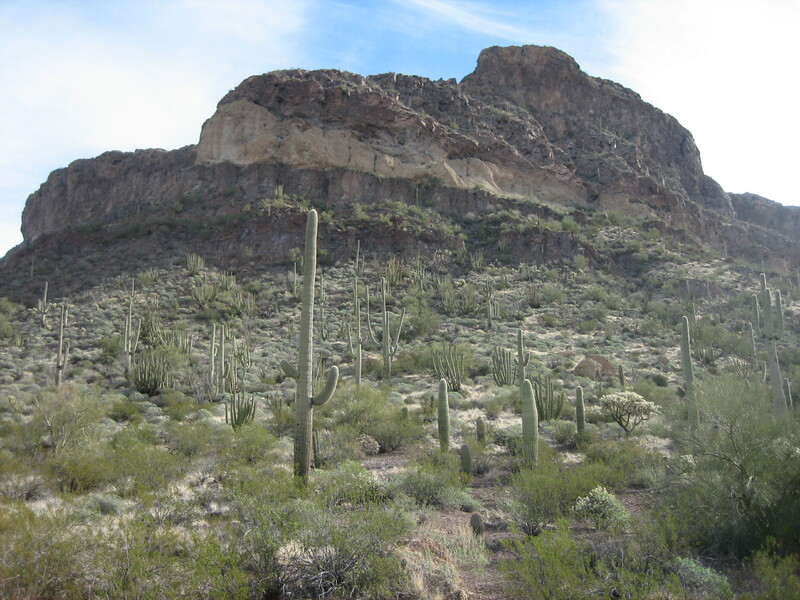 densely-growing saguaro, some particularly large, and the road has excellent views south for many miles, as far as the Cubabi Mountains in Mexico. I learned a lot on this van tour, such as the difference between an organ pipe cactus and a senita cactus, the role of nurse plants, and the proper pronunciation of “saguaro” [Sa – WAH – ro]. I would have enjoyed myself had I just driven around in the desert alone or with Miss M, but having a knowledgeable guide really made the drive much more interesting, educational, and entertaining. I would absolutely recommend this tour for anyone visiting the Organ Pipe Cactus National Monument. There is no additional cost for the tour; it is included with the $12 pass which allows access to the OPCNM for seven days. 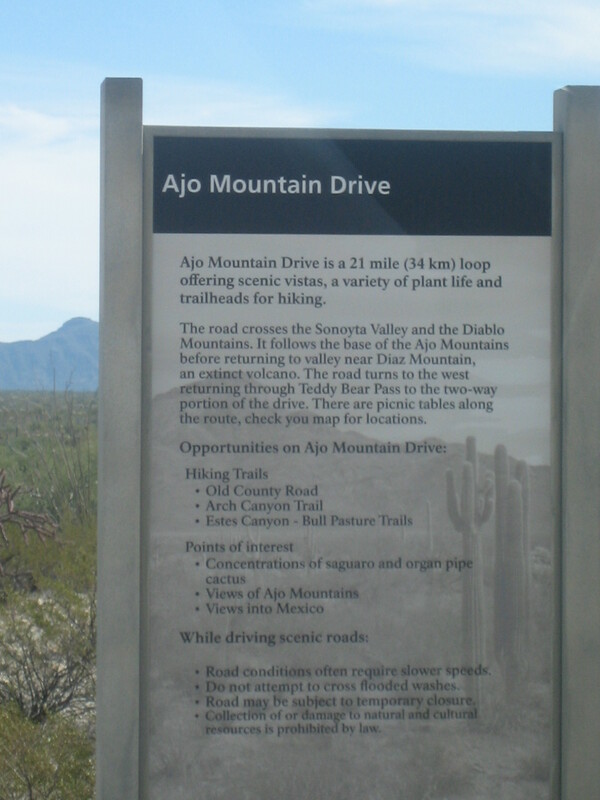 If I am ever back in the area, I might make the Ajo Mountain Drive on my own with the Ajo Mountain Road Guidebook (available free in the Kris Eggle Visitor Center, according to http://www.nps.gov/orpi/planyourvisit/driving-and-biking.htm) by my side. I think the van would make it just fine if I took the drive slow and easy. I would like to hike up to the arch in Arch Canyon and spend time looking more closely at the plants and landscape and taking more photos. But if I never get back to the Ajo Mountain Drive, I won’t be disappointed, because the tour I went on was so good. Hi, Blaize! enjoyed today’s post, and thank you for the link to the National Parks page. I immediately looked up my favorite National Park, Big Bend in South Texas. Found out some neat things I did not know about since going there last, years ago! Thanks for reading, Lelia. I’m glad you enjoyed the post about the Ajo Mountain Tour. I’m also glad the link to the National Parks page was useful to you too. I’ve lived in Austin a time or two, and never made it to Big Bend. Can you believe that? Maybe you will be able to get back there before too long. Just got back from Organ Pipe NM loved it there, also at Tuscon gem show what fun. Took the rv out for a test run spent 3 weeks an the road.